Airport officials are considering lifting the three-decade-old ban on flights longer than 1,500 miles from New York’s LaGuardia Airport. The move would elicit a stream of profitable flights to the West Coast. Without the “perimeter” rule, officially in place since 1984, new transcontinental flights could commence between LaGuardia and cities like Las Vegas, Seattle, San Francisco, and Los Angeles currently served only by the other two major airports in the New York area, JFK and Newark, which are farther out from Manhattan. “Lots of places outside of that perimeter would be natural additions to the network,” said Dennis Cary, global managing director of Airline Advisory. But airline space is tight at LaGuardia. 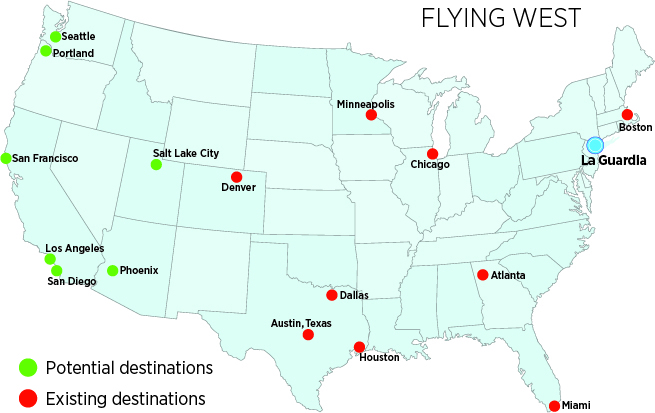 More West Coast flights, and even some to Western Canada, such as to Vancouver, would come at the cost of fewer nonstop flights to smaller cities such as Roanoke, Va., according to experts. There might be a shift toward long-haul business flights on bigger planes and away from smaller planes, says Stephen Sigmund, executive director of the Global Gateway Alliance. More business flights from nearby John F. Kennedy International Airport might move to LaGuardia, giving the former more room for European flights, he said. “And so you’d see LaGuardia consolidate as a more business-centric airport and Kennedy would then expand as the tourism gateway airport,” said Sigmund. The idea of lifting the rule has long been under consideration and recently surfaced again as Port Authority officials’ plans for LaGuardia diverge from their initial motivations for setting the rule in 1984. “The real question is whether the original rule is still an important policy consideration, or whether, based on the desire of the airline industry, letting the airlines have more freedom has reached its time,” said Cary. The rule, which began after 1947 when the Port Authority took over the airport as a way to alleviate traffic congestion, became official in 1984. It doesn’t apply to Denver, which is located just over 1,700 miles from LaGuardia, and it isn’t in effect on Saturdays. While officials wrangle with the possible effects of lifting the rule, many have said that LaGuardia is also in serious need of an update. The start on a project to replace the Central Terminal Building in LaGuardia, often called Terminal B, has been delayed until April. “Our point of view is that the Central Terminal Building should have already started. They need to pick a developer and they’re late in doing this,” said Sigmund. Global Gateway Alliance Chairman and Founder Joe Sitt said in a statement that replacing the dilapidated Central Terminal Building was a more urgent priority than lifting the rule. Once that is handled, lifting the perimeter would be “common sense,” said Sitt.